This entry was posted on June 26, 2015 by supplements2u. When working out there is a very basic principle to remember. Use heavy weight to build and light weight to tone. In our bulking plan we use both to help achieve the best results. Let us think about the logic briefly, perhaps you have been doing sit ups, some bench pressing, and leg lifts but you have not seen any muscle mass forming. When was the last time you did a burn out or maxed out your weight? If you answer truthfully, the odds are that it has been a while. And this is why no muscle mass has formed. Our bodies quickly get accustomed to routines and to weight restrictions. Consider that an obese person can haul the weight of their stomach around and rarely does the body say “wow, I am lifting 100 extra pounds”, but go and get two 50 pound bags of dog food and your arms will start to go sore from the NEW EXTERIENCE of strain on the muscles. When you work out with heavy weight, you need to ensure you have a person to spot you. Remember, that you are lifting the weight, do not make the spotter do all the work. They are there to make sure you do not hurt or kill yourself trying to lift the weight. They are not there to do the workout for you. HEAVY weeks should start by doing 5 sets of your max weight. Try to get 3-5 reps in per set. Some would advise you to try for 5-10, but it is not needed. You are pushing your body to the limits here and excess strain may cause damage. You should feel pushed to your boundaries, but you should not feel like you are endangering yourself. 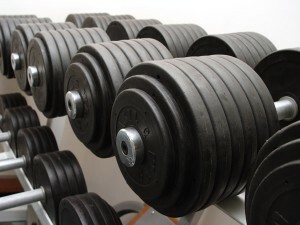 Every time you go heavy after the first week add 5 to 10 pounds onto the max weight. The reason that you go light 3 out of the 8 weeks is to keep your body from getting used to the excessive weight. It is also good for toning the bulk muscle that you are building. It does not good to rip and build muscle mass if the body quickly gets used to the routine and you lose it (or the mass is there without any strength). Light weight also gives the muscles a chance to heal while at the same time exercising those muscles. Light weight does not mean the absence of weight. Keep your weight at about 50% of your max weight. You should do 5 sets of 10 for every exercise when working out with light weight. On your final exercise do a burn out (lift the light weight until you cannot do anymore). Working your core shoulders and triceps. Exercise 1: Start out by warming up with some mountain climbers keep your legs moving constantly for one minute. Take a 15 second break and do 3 more reps. Exercise 2: Reverse crunches (5 sets of 20). Remember that you are focusing on your core, not your back. Keep your back straight when doing your reverse crunches. Bring your legs up as far as you can and then hold the position for 10 seconds before lowering your feet. Do not let your legs rest but keep them about 3 inches from the ground while doing your reps. This will keep tension on the core. Exercise 3: Shoulder presses. Ensure that you are NOT lifting the weight directly over your head and that you NEVER lock your elbows. Preferably, use a curl bar to do your shoulder lifts but you can also use a straight bar if you must. When you do your shoulder presses you want to ensure that you do not let the bar rest on your shoulders. Lift the weight with your arms and shoulders. Do not bounce the weight, swing the weight up with your back, or use your legs. Focus on using your shoulders for this exercise. Exercise 4: Immediately after you finish your shoulder presses move into doing bent over rows. To do this exercise you will need to ensure that your knees are slightly bent. Bend over so that your body makes an L shape (or your body forms about a 90 degree angle with your legs). Grip the bar wide, as wide as you can. Raise the bar to your chest while remaining bent over. This exercise will work your trapezius and shoulders. It is different from a close grip exercise in that more strain is put on the back and shoulders. Exercise 5: Shoulder shrugs and lawn mower pulls. To do this put dumbbells in each hand. Shrug your shoulders (do 5 sets of 20). For “Lawnmower” pulls, place the weight beside a bench. With one hand grip the weight and with the other hold the bench. Bend your body so that it is parallel with the bench. Pull the weight up in a quick motion from the floor until your arm forms a 90 degree angle. For your legs, the only real exercise that you will need is a squat. Ensure that you use a back support and that you keep your legs from buckling when lifting. If you need to see the proper form, ask someone to demonstrate or watch a YouTube video. On days that you are not doing squats you should be taking a 15-30 minute jog. Let your body heal for a day. You can actually cause your body NOT to build muscle if you work out too much without giving the body rest. Exercise 3: Do three sets of Arnolds. If you do not know what an Arnold is, here is a great video here. Do 6 sets of 10. Exercise 4: Single arm dumbbell curl. Do 6 sets of 10. To get the best results, you should try to maximize your sets and reps if you feel that your body is not getting enough of a workout. Always try to push your heavy weight to the limit. Remember, heavy weight builds and light weight tones. Consider also that you should be eating a lot of proteins, cutting out your fats, getting proper sleep, and doing cardio at least 3 times a week. As with any routine you need to ensure your body can take the stress before starting.